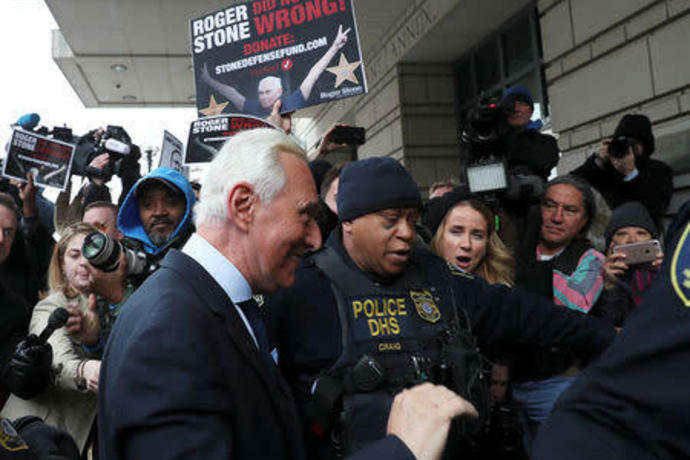 WASHINGTON (Reuters) - President Donald Trump's longtime political ally Roger Stone is expected to plead not guilty on Tuesday to seven criminal counts after becoming the latest member of Trump's inner circle charged in Special Counsel Robert Mueller's Russia investigation. 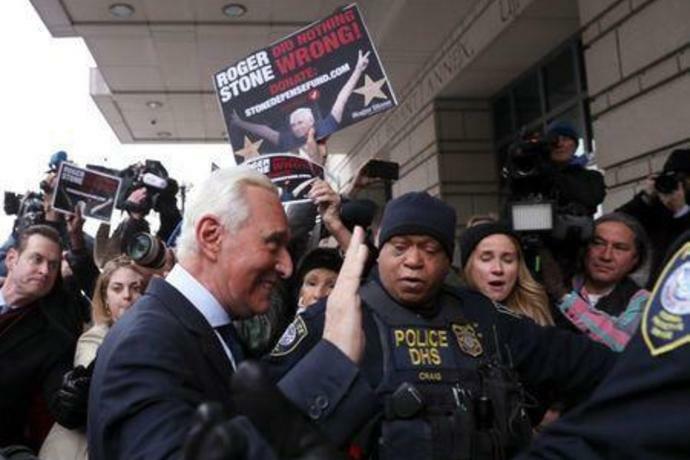 Stone, arrested on Friday in an early-morning raid on his home in Fort Lauderdale, Florida, arrived for an arraignment in U.S. federal court in Washington on charges including making false statements to Congress, obstruction of an official proceeding and witness tampering. Stone smiled as he passed through a gauntlet of reporters outside the courthouse. A small group of protesters waved Russian flags and a placard that said "Dirty Traitor" while other people showed their support for the 66-year-old veteran Republican operative. 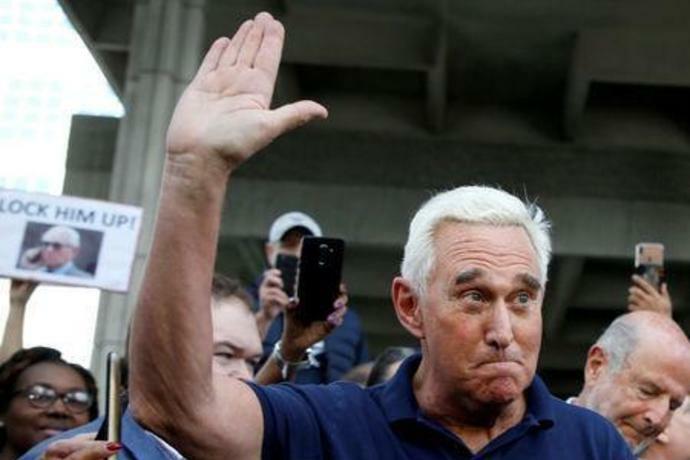 The indictment said Stone told members of Trump's 2016 presidential campaign that he had advance knowledge of plans by the WikiLeaks website to release damaging emails about Trump's Democratic opponent, Hillary Clinton, that U.S. intelligence agencies have concluded were stolen by Russia. The indictment did not indicate whether Stone knew that Russians had stolen the emails by hacking into computers used by Clinton's senior campaign adviser John Podesta and the Democratic National Committee. Mueller last year charged 12 Russians accused in the hacking as part of his investigation of Russia's role in the 2016 election, whether Trump's campaign conspired with Moscow and whether the president has unlawfully sought to obstruct the investigation. 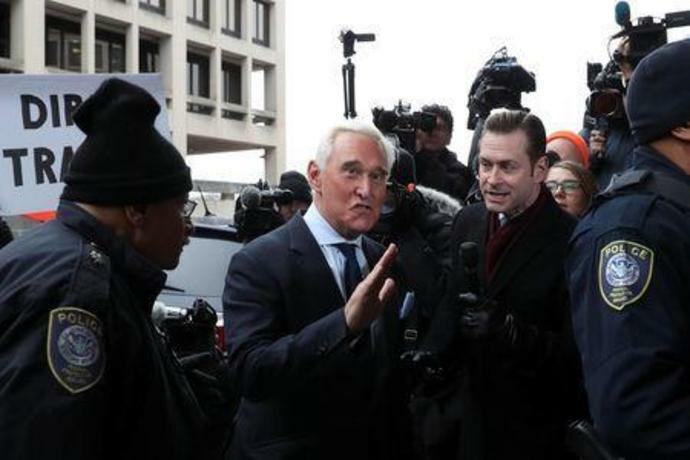 The charges against Stone marked the first time Mueller's team has publicly tied the Trump campaign to WikiLeaks, and raise questions about what Trump may have known prior to the public release of the stolen emails. The charging documents said a senior campaign official "was directed to contact Stone about any additional releases and what other damaging information" WikiLeaks had about Clinton's campaign but do not disclose the identity of the person who gave the order. He has declared his innocence. In comments to journalists on Monday in Florida ahead of his arraignment, Stone accused Mueller of "a raw abuse of power." Trump has called the investigation a witch hunt and denied any collusion. Russia has denied U.S. intelligence community's finding that Moscow interfered in the U.S. political arena. Thirty-four people have been swept up in the Mueller investigation. Those charged include Trump's former campaign chairman and deputy campaign chairman, former national security adviser and his former personal lawyer. It remains unclear whether any further charges have been filed. Acting U.S. Attorney General Matthew Whitaker on Monday said Mueller's probe was close to wrapping up and that a report was expected soon. WASHINGTON (AP) - After nearly two years of waiting, America will get some answers straight from Robert Mueller. Until special counsel Robert Mueller&apos;s report is revealed, the charges he filed - and didn&apos;t - offer the only detail of the Russia probe&apos;s findings. Aides and lawyers to President Trump will be assigned sections of Mueller&apos;s report to digest so they can quickly craft statements and talking points.